It was a game won by a header from a corner, but there was so much more to it than that. This was an absorbing semi-final that would have functioned as a perfectly acceptable decider. 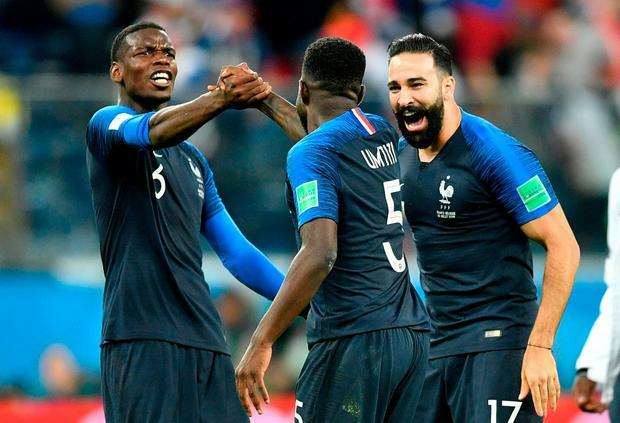 France prevailed by the minimum margin, which is how they tend to do things under Didier Deschamps, yet this was impressive rather than enervating. Once they overcame a stodgy start, there was a sheen of all-round package that screamed champions-elect. Pragmatic defending, as evidenced by the way in which they cut out Belgium's significant set-piece threat. Energetic midfield play, courtesy of the Kante-Pogba-Matuidi axis that overpowered Belgium's engine room and stifled the supply line to the playmakers. And then there was the subtle quality of Antoine Griezmann and the thrilling brilliance of Kylian Mbappe, a teenager uninhibited by the pressures of the biggest stage who was casually trying and executing flicks like this was a playground kick-about. He embraced cynicism in the dying stages, drawing a yellow card for wasting some of the six minutes added time. But there was a distinct absence of suspense as a good Belgian side were done. Thibaut Courtois raged at France's approach, claiming that they didn't try to play against a side that was stronger than them. But the strongest side advanced here. It was informative that the closest they came to a late equaliser came courtesy of a 35-yard Kevin De Bruyne cross that was narrowly misjudged by Romelu Lukaku. All they had left in the locker was Hail Mary efforts. France had broken them down. At full-time, Didier Deschamps and his staff led feverish celebrations. For a second, it was almost like they had won the thing. Two summers ago in Marseille, a semi-final triumph over Germany was greeted in the same manner and it was followed by a spectacular anti-climax. That experience should check any exuberance. Yet this is a side that is slowly working its way through the gears, from an unimpressive opening grind against Australia to this purposeful dismissal. It has been said that this tournament is devoid of an outstanding side, yet it's France that have the raw materials to reach that status. Granted, it didn't look that way in the early minutes. This was a gripping match, albeit one that was played out in a curious atmosphere. The European sides really haven't brought much to this competition in terms of travelling support and it was brutally apparent during a first half where the most sustained period of singing came from Brazilian fans who had bought their tickets on the assumption they would make it this far. But the quality of the fare highlighted why these teams had emerged from the stronger half of the draw. Big names made their presence felt. Mbappe set the tone for his own display with a purposeful change of pace and burst down the flank inside 30 seconds. Eden Hazard followed it up with a thrilling dart of his own as play quickly switched to the other end, with the Chelsea star's tormenting of Benjamin Pavard a feature of the first half. France were second best in the period where punters were remarkably still making their way to their seats. Indeed, there was a frustrating absence of ambition. 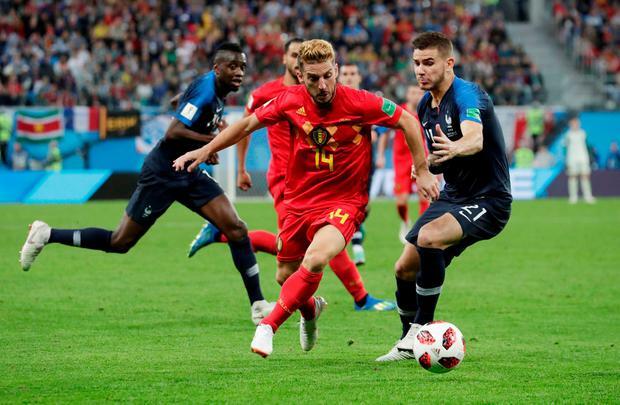 Just short of the quarter hour mark, every one of Deschamps' players was in their own half as Belgium played the ball out from deep. They were waiting for errors; maybe Courtois formed his conclusion then. Roberto Martinez had stuck with a back four in the absence of Thomas Meunier, with Nacer Chadli pressed on as an attacking right full-back. De Bruyne was loosely positioned on the right of a three-man front line with Lukaku through the centre and Hazard causing havoc on the left, but they rotated freely and chances followed. Hazard did stir the crowd with a pair of shots that fizzed agonisingly close. Hugo Lloris made a fabulous save from Toby Alderweireld after a corner broke down. These were key moments, as France steadily rose from their slumber. Martinez had introduced Moussa Dembele into the midfield area next to Axel Witsel and Marouane Fellaini and he laboured as Paul Pogba began to make inroads and Griezmann's link play posed difficulties with the Atletico Madrid star sauntering into pockets of space between midfield and attack. Ironically enough, the best chance of a first half goal would fall to Pavard, with Mbappe distracting red shirts that weren't anticipating a clever pass from the explosive talent. Thibaut Courtois emerged to save. There were times where Olivier Giroud didn't seem on the wavelength as his gifted striking partners, especially when he failed to anticipate an instinctive Mbappe flick across the box, but he served his purpose in the lead up to the only goal with Vincent Kompany blocking his goal-bound shot as France resumed brightly. 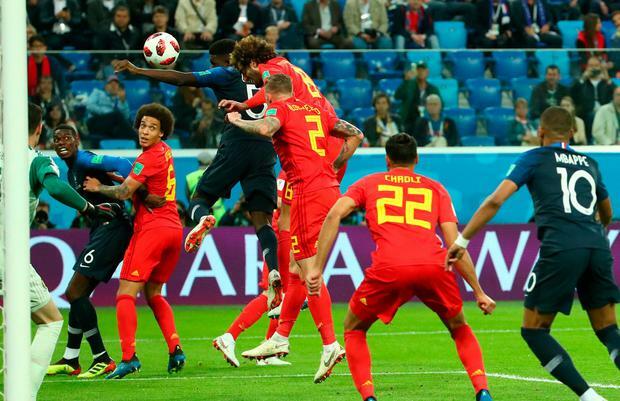 Griezmann's subsequent delivery was precise and Samuel Umtiti ghosted away from Alderweireld to get up above Fellaini and provide the winner with the aid of a slight flick off the Manchester United player's distinctive bouffant. France had the crucial advantage, although Mbappe was determined to add to it. The 19-year-old was the game's star, and displayed his full repertoire. It's not just his ability to coast along as if he's on an escalator while tired pursuers are toiling up the stairs. There was quick feet that wouldn't have looked out of place in the Bolshoi, with a ridiculous dragback flick and pass outfoxing Kompany to release Giroud who could not finish. Belgium had to press, and that left dangerous space that he exploited. But the Red Devils' struggles could be traced through De Bruyne. In the search for parity, Martinez ended Dembele's nightmare and introduced Dries Mertens, with De Bruyne dropping deeper in an attempt to conduct. 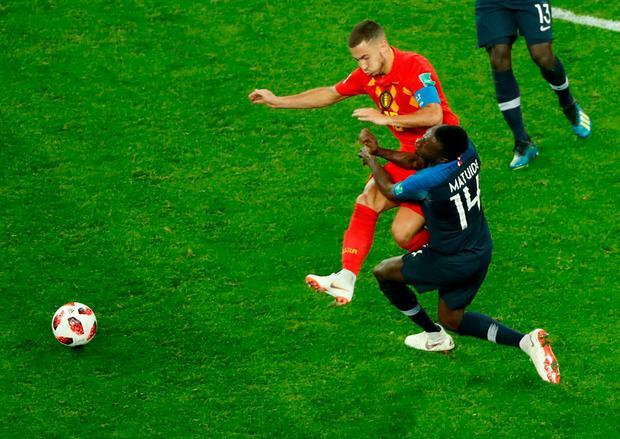 Hazard kept poking away for gaps, but France closed them off, although a collision came at a cost for Matuidi who could not continue. His replacement, Corentin Tolisso, missed a gilt-edged chance but it mattered little. This French side save their goals for when they really need them.